There is a famous song about San Francisco and the lyric goes something like this. Have you heard of this song? If not, check out the short video clip below, a song of San Francisco. It 60’s oldies and may be people that time especially hippies love wearing flower in their hair. I didn’t see anyone wearing flower in their hair anymore. 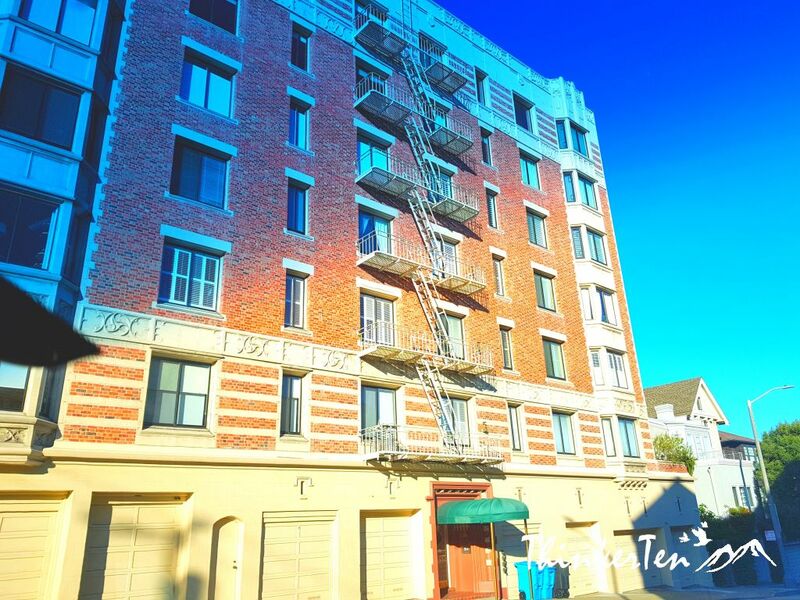 San Francisco is known for its cool summers, fog, steep rolling hills, eclectic mix of Victorian and modern architecture. 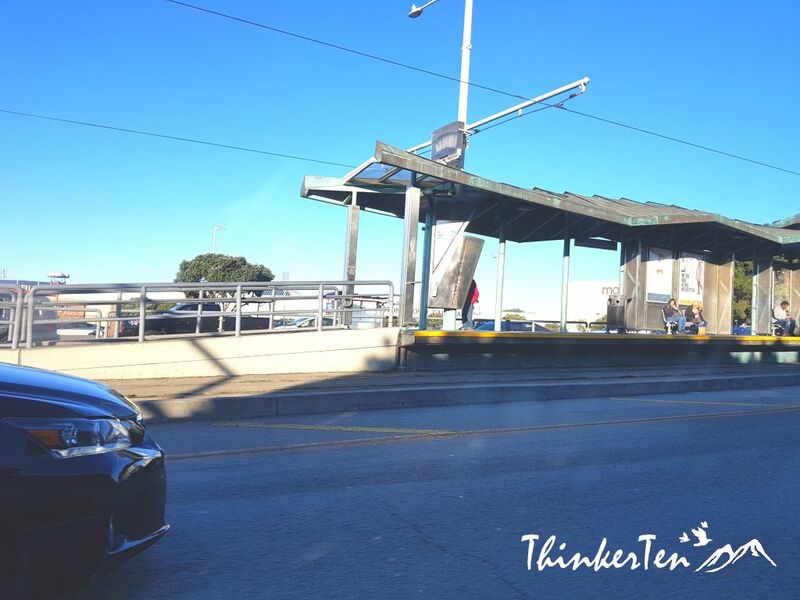 These are some of the interesting building architecture we passed by while driving to Golden Gate Bridge. The old flats here are unusual too, with fire escape leader zig-zagging across windows, skyward, look pretty awesome. Just like some of the movie scene which I use to watch in the American movie. From Baker Beach, Battery Godfrey, Fort Point, Torpedo Wharf, Crissy Field, Fort Miley, Coit Tower, Battery Spencer, Vista Point, Fort Baker and Moore Road, Hawk Hill, Kirby Cove, Slackers Hill. 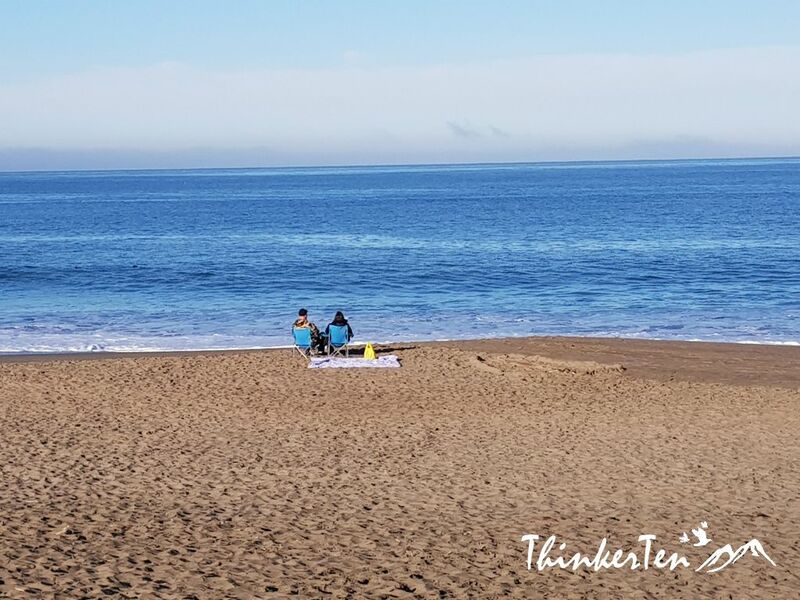 It was only 8 am plus but there are already a couple enjoying the sea view at the beach. If you choose Vista Point, you’ll find a large parking lot and popular visitor center and ample room to find a nice angle. Come here as early as possible, else you won’t be able to find a parking lots. This place fill with tourists. Why named the bridge Golden Gate Bridge when the color is not even gold but red, actually is orange color? 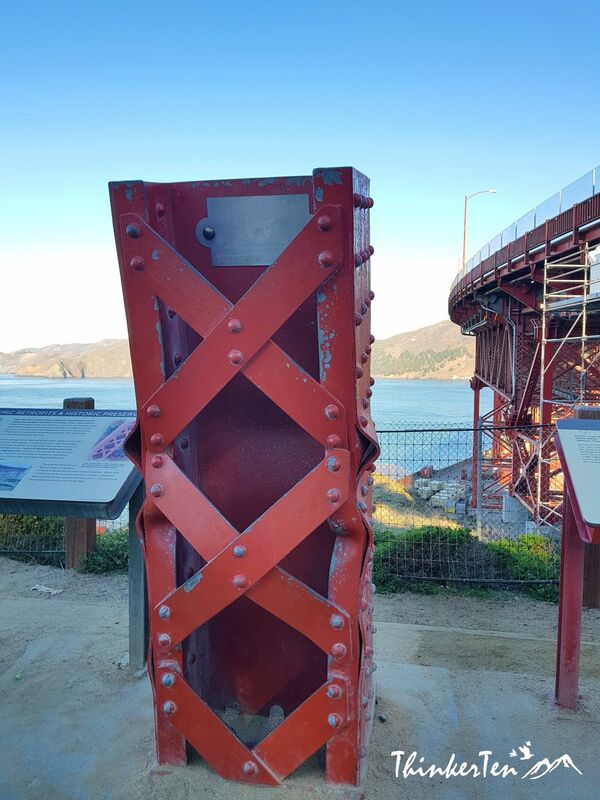 The Golden Gate Bridge isn’t named for its own coloring but rather for the mouth of the San Francisco Bay, which was named so even before the California gold rush. The term Golden Gate refers to the Golden Gate Strait which is the entrance to the San Francisco Bay from the Pacific Ocean. It is generally accepted that the strait was named “Chrysopylae” or Golden Gate by Army Captain John C. Fremont, circa 1846. It is said it reminded him of a harbor in Istanbul named Chrysoceras or Golden Horn. 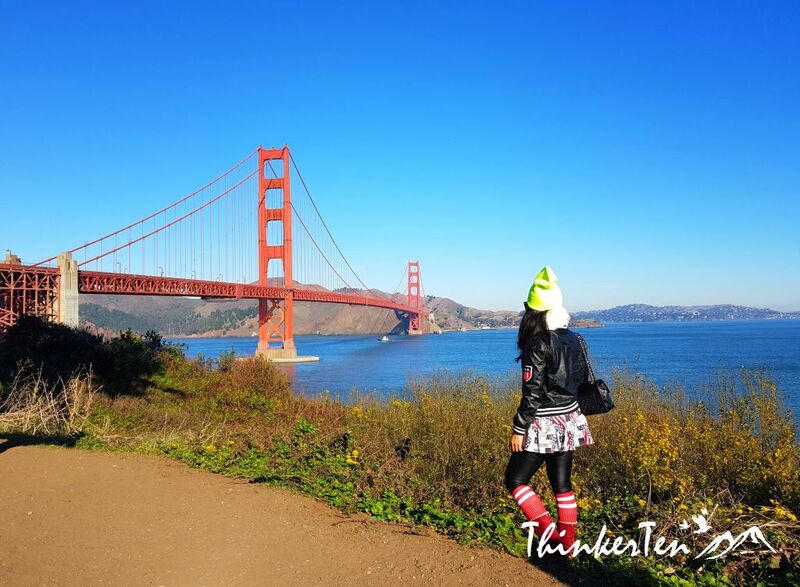 There are few things you can do in Golden Gate Bridge. Walking across the bridge by foot and burn some calories. You can always make a U turn back if you think you can’t go forward anymore. You can also rent a bike at the Fisherman’s Wharf and cross the bridge, that way the chances of making a U turn back is lower. If you cycle to the end of the bridge, go to Sausalito or Tiburon town, get a ferry for a scenic ride and more picture opportunity from the ocean and back to San Francisco. The color of the bridge is International Orange not red, and was chosen in part because of its visibility in the fog. The color of the bridge looks really beautiful with the surrounding of deep blue ocean, light blue sky & dusty brown color mountain. 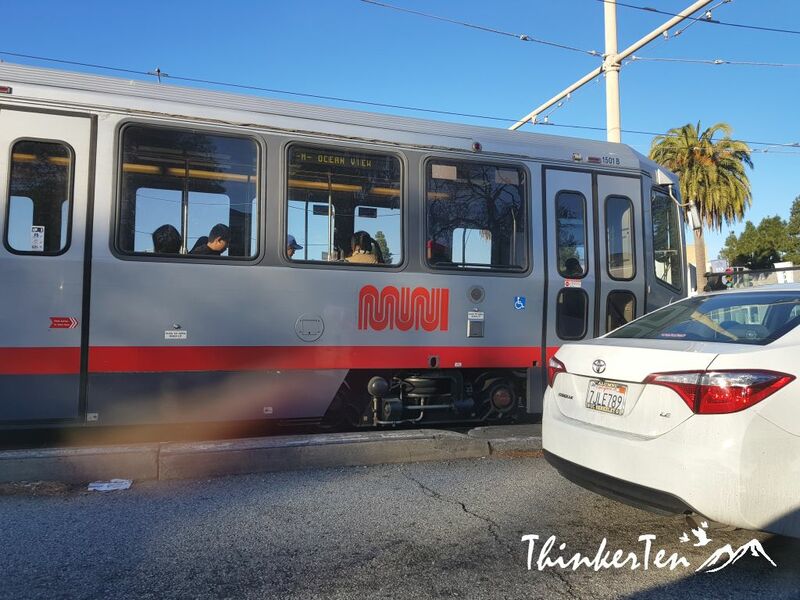 The Muni Metro is a light rail system serving San Francisco, running together on the road with the cars. 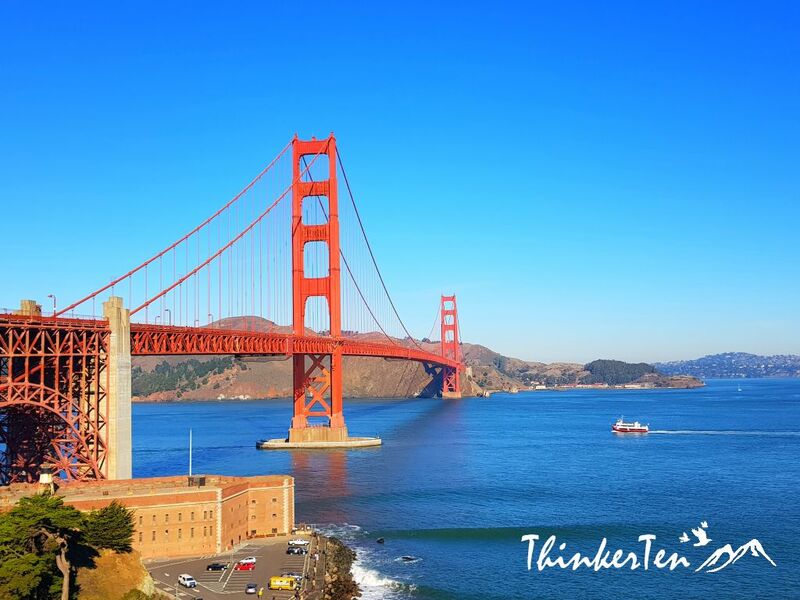 The Golden Gate Bridge is one of San Francisco’s most iconic landmark that one can never missed. There are many places you can view the Golden Gate Bridge and get good photographs. However, go early in the morning is the key to avoid crowded tourists and photo bombs. Having a hike across the bridge should be great fun to do in Golden Gate Bridge. My mum went on a trip to San Francisco when I was about 9 years old, and when I saw her photos when she came back, I’ve wanted to go there ever since! I’ve not yet been to California, but it’s on my bucket list!! I hope to visit the US one day and hopefully on that trip I can go to San Francisco and see the Golden Gate Bridge IRL. The Golden Gate Bridge is the most iconic landmark in San Francisco also one of the most beautiful engineering marvel. Hope you will enjoy while you visit San Francisco. 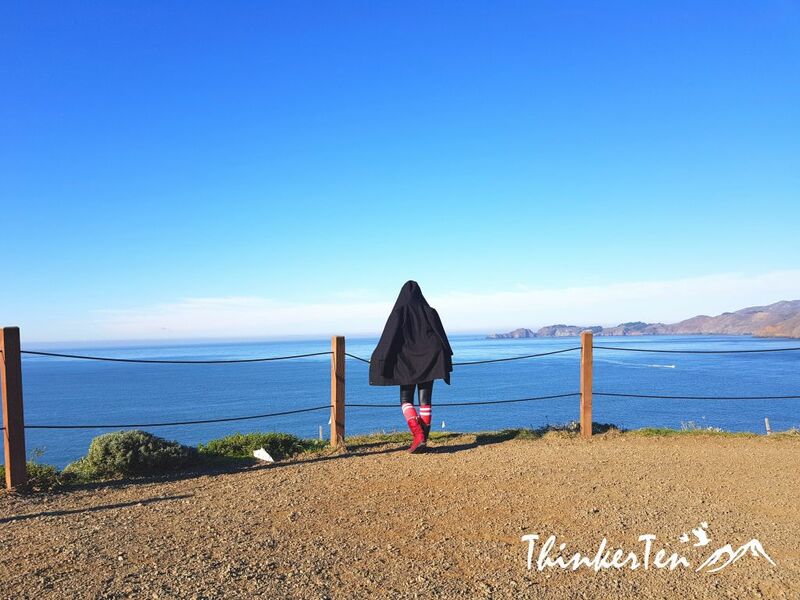 I visited San Francisco twenty years ago – where has the time gone! Such a lovely city . 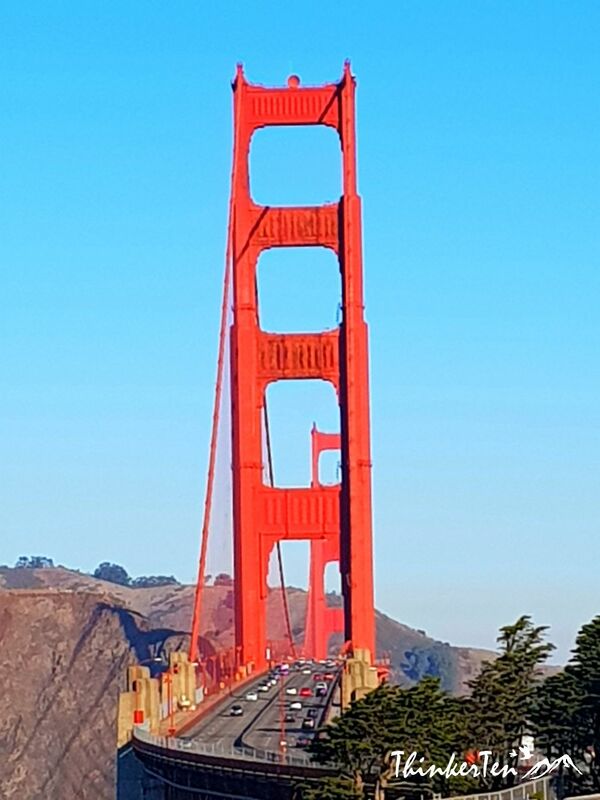 I’ve always wanted to see the Golden Gate Bridge, your photos are amazing and thank you for the great tip about going early. I am not a fan of big crowds! My MIL lives in the Bay Area and so we’ve spent lots of time there. 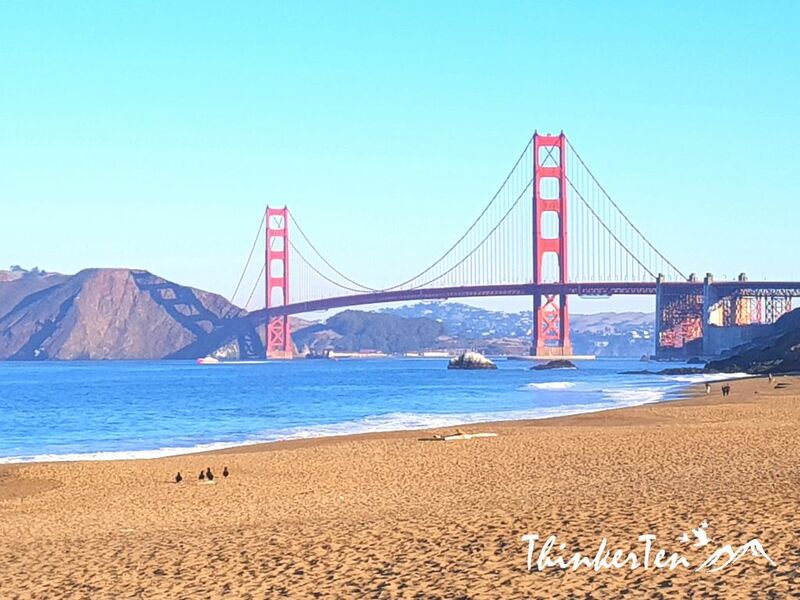 You’ve captured the Golden Gate Bridge so beautifully! How lucky is your MIL, I guess she lives in one of the best place in the world. Nice scenery, good weather and nice people. Glad you love the song, it is one of the classic, about San Francisco, about the hippies back then. A beautifully captured experience. The skies are so blue. It looks as though you picked a great day to go. I would love to visit San Francisco and the iconic Golden Gate Bridge must surely be one of the main attractions to see! Thanks for sharing. Ok so I have to ask, did you see the Full House house? That would so be a stop I would have to go to. You can’t go to San Francisco and not see the Golden Gate Bridge. It’s a staple and it’s a must see! I think the pictures are perfect. Love that song! What a great adventure you have here. Road trips are my favorite, I would exactly do the same. Those couple are just so sweet, the Golden Gate Bridge is so beautiful to look at. Hopefully one day I can visit it. San Francisco looks like a fairly relaxing place! Thanks for the tour. I’d love to visit. Always wanted to go to San Fran. Now I feel like I kind of have! Super cool tidbit about the color of the bridge… don’t want a boat or plane crashing into it!! 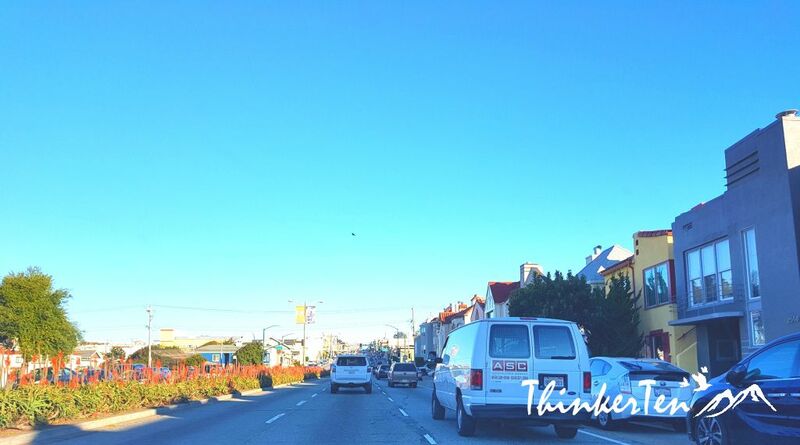 OOh…I love San Francisco! Great post. The Golden Gate bridge is definitely a must see! Looking from far is always a great idea, you get to admire the sky, the sea and the mountain altogether, very picturesque! What a special trip this looks like! I think San Francisco would be really great to visit. Such beautiful architecture and it just looks like it would be a great time! Golden Gate Bridge is so iconic and beautiful, I have only seen it on tv and movies. I would love to visit San Francisco and see the iconic Golden Gate Bridge . Visiting San Francisco, especially the Golden Gate Bridge is one of our family’s dreams. Thanks for sharing these great moments! We’re actually planning a family trip to San Fran from Orlando FL, so reading this got me even more stoked about it. I love your tips, especially about getting there early to avoid all the tourists! Going early is always the no 1 tips to avoid photo bomb and have a great picture. Most importantly is there are still plenty of car park. I literally was JUST in SFO a month ago. It’s one of my favorite cities! I was lucky enough to be there during Restaurant Week so it was a treat getting to try some yummy food. it was a work trip so no touristy stuff this time around unfortunately. I love San Francisco! We spent some time there years ago, but we definitely need to go back soon. I had the best pizza there! I’d really love to visit California someday and to visit my old friend there and to see the golden gate bridge. The sky is magnificent, and the pictures are great! Look like you’ve a had a great experience! Haven’t been to San Fran in years, but this post makes us want to visit again soon. Your photos are great! I recalled my days in San Francisco while reading your post and watching your pic at Golden Gate Bridge. I will never forget my selfie moment at that golden beauty. I used to love that song when I was a child. In school, our teacher would often bring us tapes to learn English from, and on one of them there was this song. I would love to visit SF and see the Golden Bridge myself. So far I didn’t reach the States. Your descriptions and pictures of San Francisco are beautiful, I would love to visit this city one day! It is one of my favorite cities too in California. The iconic bridge really matches so well with the blue sky, ocean and surrounding mountains! San francisco really is a city i want to visit! so far away though! but it looks so pretty! the houses, the beaches, the bridge! OMG I love that song. San Fransisco looks amazing. Their housing is astounding! They must cost a fortune though. I have always wanted to take the public transportation there. Beautiful! 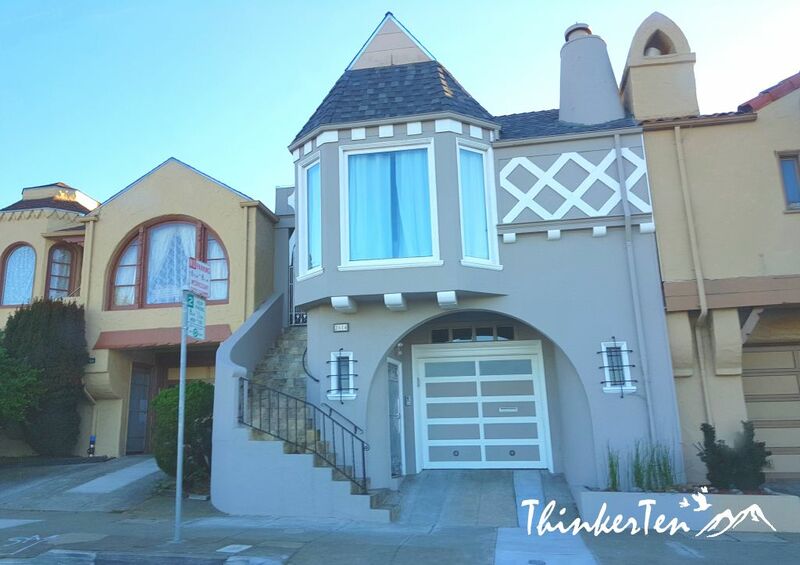 The houses are really unique in San Francisco – you will notice there are always big windows at the front of the house, very Victorian style! I agree it must be cost a fortune, since San Francisco is a big city. Amazing! San Fransisco looks amazing. Their housing is so beautiful and unique. Great post. I loved the pictures . I have always wanted to visit San Fransisco, especially the Golden Gate bridge. Your pictures are so pretty, I bet you had so much fun. San Francisco is on my list to visit this year. I love your photos, great angles of the Golden Gate Bridge. Thanks for the background, I have always wondered why it was called Golden when it’s red. Thanks for this beautiful tour of the Golden Gate Bridge in San Francisco. I’ve always read about it in books and wish to one day walk on that bridge.